Combine the dry ingredients together in a large bowl. In a separate bowl, combine the wet ingredients, whisking until well combined. Then, slowly fold the wet ingredients into the dry, adding more buttermilk if the batter is a little thick. 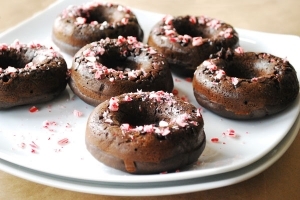 Lightly coat a donut pan with nonstick cooking spray and then sprinkle in a small amount of the mini chocolate chips. Carefully spoon in batter and bake for 10-12 minutes or until a toothpick inserted comes out clean. After a few minutes rest remove the donuts from the pan – they should pop right out. Invert and top with a sprinkle of finely crushed candy canes, which should stick right to the mini chocolate chips. Serve immediately. These would make a lovely addition to coffee, hot cocoa or hot tea on a chilly winter morning. Note: Whole wheat pastry flour has all of the nutritional benefits of regular whole wheat flour but is processed to be lighter in texture, making it exceptional for use in healthier baked goods. You could use regular whole wheat flour in this recipe but it will yield a slightly more dense, hearty donut. Find whole wheat pastry flour at most health food stores.